Skipper: For the Change We Need. I didn't vote for Barack Obama, but I will admit that his "Hope" poster makes for a fun meme. If only Skipper was real and a human, I'd vote for him in 2012. 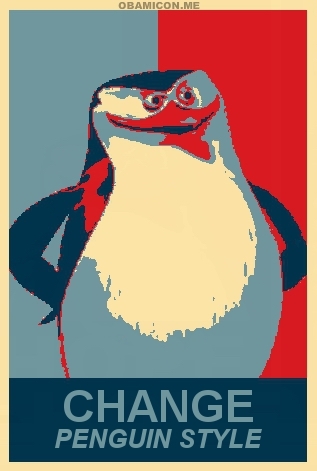 This image was mainly generated through Obamicon.me, with a few added enhancements.. Wallpaper and background images in the 마다가스카의 펭귄 club tagged: skipper penguins of madagascar poster barack obama change hope poster parody 2012 presidential election. Hey, maybe he could save us from the Mayan apocalypse!... The one which I totally... don't believe in... heh. @PenguinStyle: Hey, you're right! Interesting coincidence!